I’ve have never been to South Tyrol, an autonomous province in northeast Italy, and I’m pretty sure that before drinking Tiefenbrunner Pinot Grigio I’d never had a wine produced in the country’s smallest wine growing area. However, since trying this very good, crisp, dry wine, I now consider South Tyrol to be one of my favorite wine regions, and I have put it on my list of places to visit. Before doing the research for this column, I knew little about South Tyrol, other than it was in the Alps and Tyrolean men wore leather knee-length pants, long socks and jaunty hats with feathers stuck in them. I wrongly thought South Tyrol was in Austria. After all, the wine is made in an Austrian style. My error is understandable because the region has had a long history of switching back and forth between Italy and its neighbor to the north, according to my review of several online sources. Even today, almost half the residents feel closer ties to Vienna than they do to Rome, and a few years back about 46 percent voted to secede and rejoin the other Tyroleans living in Austria. There was little question about where allegiances should have been placed in 15 B.C., however. That’s when Roman commanders Drusus and Tiberius took over and made South Tyrol part of Roman Italy. The area thrived as a crossroads in the Eastern Alps, and the adopted language was Vulgar Latin or Ladin, which about 4 percent of the population still speaks. More than twice as many South Tyroleans speak German than Italian today. After spending a little time — most of the fifth and sixth centuries — under the Goths and a few other rude sorts, South Tyroleans welcomed the Bavarians, who made everyone go to church and taught them to speak German, which was useful because it wasn’t too long before the Holy Roman Empire brought South Tyrol under its wing and put bishops in charge. The next few centuries weren’t seamless, but after Napoleon was sent packing to Elba, the Austrians ruled relatively smoothly until after World War I when a 1919 treaty signed by U.S. President Woodrow Wilson on behalf of the Allies put South Tyrol with its almost 150,000 (90 percent) German-speaking residents under the thumb of the repressive Italian military. Wilson later said the treaty was a mistake and regretted his part in it. After some rough years being ruled by the Italian fascists and the German Nazis, and enduring riots and turmoil after World War II, the German-speaking population got a break. A model agreement between the Austria and Italy went into effect in 1972 that established South Tyrol as an autonomous province with self-rule. When Austria joined the European Union, the borders between the countries became a second thought and commerce has flourished. South Tyrol is now the most economically prosperous area of Italy. In 1848 when the Austrians were in charge of South Tyrol, winemaking started in the hamlet of Entiklar, population 150. Winemaking began then and continues now at Castel Turmhof, which is the home of the Tiefenbrunner family and the company’s winery. The estate was first mentioned in records in 1225, but recent excavations found Stone and Bronze Age artifacts in the area of the castle, which means that Castel Turmhof residents witnessed much of the history of South Tyrol. The castle features a 13th-century tower that is a tourist destination, and the winery has a hydropower plant that has been producing electricity for the estate and surrounding area since 1910. The plant was upgraded in 2001, the Tiefenbrunner website says. After five generations of wine production, the family business is now headed by Christof Tiefenbrunner and his wife, Sabine, who are carrying on the tradition of making award-winning wines from high-quality grapes grown on the estate and on nearby vineyards. “The art of winemaking is a valuable element of family identity. It is our daily responsibility to maintain and develop it further in a spirit of respect,” Christof Tiefenbrunner says on the website. Tiefenbrunner Pinot Grigio is made from 100 percent Pinot Grigio grapes grown in vineyards that have chalk gravel and sandy alluvial soils. The grapes are fermented in temperature-controlled stainless steel tanks and then aged with yeast sediment for four months in concrete vats before bottling. The result is a pale yellow to sandy colored, dry wine with layers of flavor and aromas of pears and candied fruits, the tasting notes say. The wine is a fine match with light appetizers, fish and such South Tyrolean specialties as barley risotto with speck (smoked, cured ham), apples and cheese. Tiefenbrunner produces 140,000 bottles of the Pinot Grigio, and it’s available in both New Hampshire and Vermont. If you can’t find it, ask your wine store to order it. It will take a couple of days, but it’s well worth the wait. 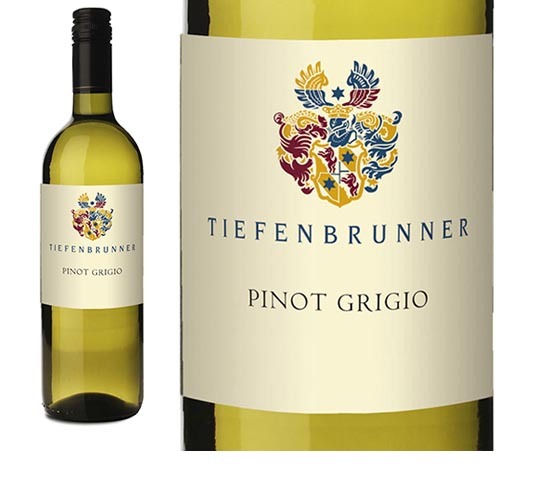 If you haven’t tried a wine from South Tyrol, Tiefenbrunner Pinot Grigio is a good place to start. I found it recently on sale for $13.99, a price that’s far below its excellent quality.